The H.Upmann Connoisseur No.1 is a classic Habano, a smooth and rich medium Coronas Extra, 5" (127mm) long, of 48 ring gauge, and comes in a 25 cigars box. 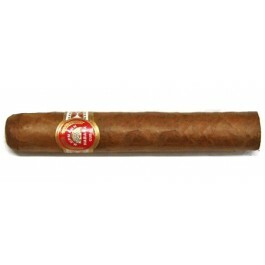 Among the very best robustos, the H Upmann Connoisseur No. 1 is also cheaper than the other top cigars. Strong smell, very good tobacco taste and satisfying smoke. • It's a smooth Hermoso No 4. For beginners, it may be an introduction to the Robusto world. • The perfect choice for any summer outdoor activity. This smoke is highly recommended!!! It has pure the traditional Cuban tobacco taste!! This slightly dark wrapper is really pleasant to the touch with small veins. A mild smelling wrapper and foot. Faint aroma of straw and tobacco. The Upmann Connoisseur No 1 burns evenly with a perfect draw. Terrific effort with the flavor. The beginning is mostly woody, deep and intense. In the second third, light pepper dominates with a sleek undertone. Finally, the last third, even more flavors appear, including espresso and chocolate. Meanwhile, the spiciness fades away and the last third settles down in a perfect combination of aromas and spices. With some age, this Connoisseur No 1 has simple elegant flavors. Nuts, clean smooth tobacco. Flawless and rich. You may not have the patience but it's worth the wait.